The AIOWPS Country Blocking plugin is an addon for the All In One WP Security and Firewall plugin. This plugin will allow you to block visitors based on their country. The plugin will calculate the visitor’s country of origin by using the IP address of the user. For example, if your website or online business is aimed primarily at US web users, but in addition to your good traffic you are also currently seeing a lot of hacking attempts or unwanted SPAM and traffic say from Romania, then you can easily block people or bots which originate from that country. Identifies country of origin based on IP address with 99.5% accuracy! This addon uses a professional, commercial database which contains the latest IP and country information with an accuracy of 99.5%. Setting up and using the AIOWPS Country Blocking addon is simple. One requirement is that you will need to have the All In One WP Security and Firewall plugin installed and active before you can use this addon. After clicking the menu you will be directed to the settings page for the addon. Enter a URL in the Redirect URL field. This will be where all blocked visitors are redirected to when they try to access your site. 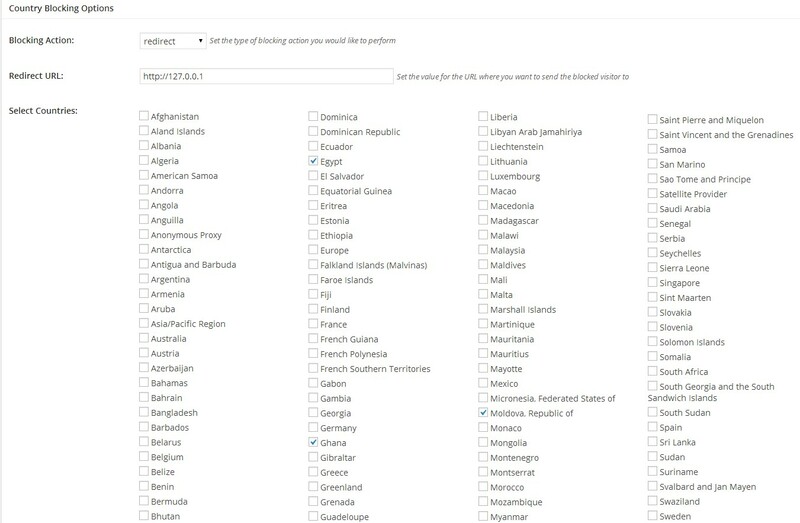 Select one or more country or region which you wish to block from your site by using the checkboxes in the Select Countries section. You have over 250 countries and regions to choose from. Save your settings by scrolling to the bottom of the page and clicking the Save Settings button. And that’s it! After doing the above, you have now added yet another powerful security feature to your site. This addon lets you block visitors to certain pages also. This can be very handy if you only want to block a country to some of your pages. For example: you may not ship your products to some countries. Using this feature you can block those countries from accessing your store/shop page. There may be times when you wish to block most visitors from a country but allow certain IP addresses or IP ranges from that particular country. You can easily achieve this using our new “Whitelist” feature in this addon. 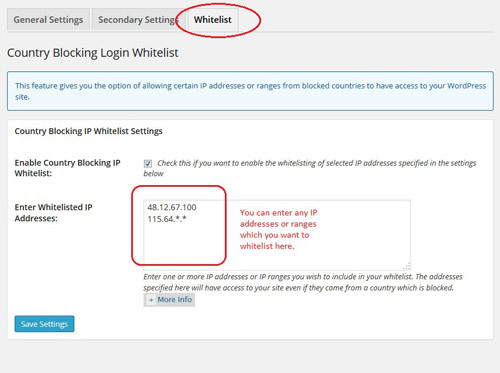 This feature allows you to whitelist any IP addresses or IP ranges even if they are part of a blocked country. For example, if a visitor originating from a blocked country tries to view your site or page and their IP address is configured in the country blocking whitelist settings, then they will be allowed to view your content. Any other visitor from that country who has an IP address not matching those in the whitelist will be blocked. Click on the following button to see the addon pricing and get it.